You and kiteboarding lessons can be a reality. We get it, you may be nervous about trying a new “extreme” sport. However, with our expertise and professional instruction, you can rest assured that kiteboarding is for YOU!! What to expect in your beginner kiteboarding lesson. Below is just an average estimate of your progression in hours. We have had kiteboarding students take anywhere from 3- 15+ hours of lessons before they graduate to becoming self sufficient. Some, even long after they can ride by themselves, take further advanced kitesurfing lessons to really mold their kiteboarding skills. We aim to make you an independent rider as soon as possible while being straight forward and honest on your progression. As a beginner, we will start your lesson with “kiteboarding ground school”. Your Elite Instructor will introduce you to your kite safety gear and the proper rigging techniques for a successful kitesurfing lesson. Theory is huge for your success so this will be covered as well. Once you and your Elite Instructor have completed the beach launch, you will continue into the knee deep waters and find the perfect spot to begin flying your first real kite. Jumping on the jet ski, instead of walking, is an available option and will maximize your time behind the kite. Each lesson is shaped specifically around the individual student’s needs. The time it takes each student to concur the first step of “confidently” maneuvering the kite will vary. We are looking to first teach you how to walk while flying, relaunch your kite after crashing it and fly it through the wind window as if you were riding on a board. Remember you must first become the driver before the rider and, with the new safety system, the kite can be released from you with only a push of a button. Alright, by now you’re getting the hang of it! Once you have a good “grasp” on the kite, your Elite Instructor will now teach you with the board. Water-starts are the name of the game. Flying the kite in the direction of travel so that it lifts you up on the board takes practice. Lots of starts and stops will be the key to success. Once you can successfully kite both directions you will progress into learning how to make a fluid effortless transitions. Our aim is to teach you to be self sufficient and feel comfortable to venture out on your own. We take our job of teaching our students very seriously. We are not your ordinary kiteboarding operation. Students come to us from around the world because of our outstanding service and private teaching grounds. It is our responsibility to meet your expectations for all lessons, both on and off the water. Safety first and foremost, always, while still focusing on making it fun! Pricing is based on an hourly rate and structured to suite all needs. Each lesson is custom-designed to your needs. Give us a call or send an email and we will discuss the details. We operate 7 days a week from sunrise to sunset. Add the jet-ski to your lesson to make your time on the water more efficient. With kiteboarding lessons a lot of ground is covered because the kite is always pulling us down wind. So, we give you the option to add a jet ski to your lesson to shuttle you back upwind. Many students learn without jet ski support and we don’t suggest the need for one during your first hours but it does make life easier. It is our highest recommendation that you take advantage of this option in the later stages of your progression. Who doesn’t like riding on a ski-doo? 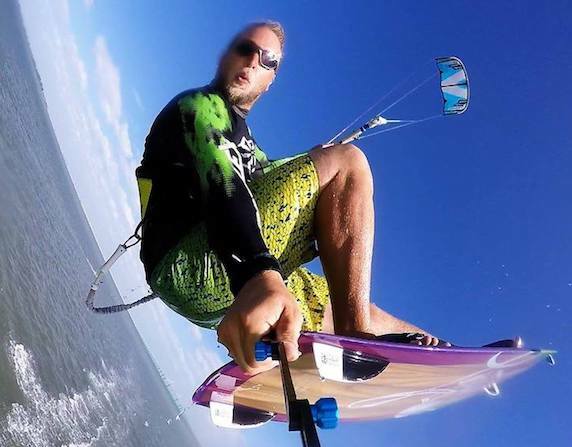 Don’t forget to capture your experience during your Elite Watersports Kiteboarding Lesson. We offer all students the option to add a GO PRO to their lesson for $35. Our Elite Instructor will record all the funny, exciting, and educational moments throughout your lesson. Just bring a Micro SD card with you. We must be prepared so please advise us during your booking so we can make a note for the instructor. Learning how to kiteboard in the Tampa Bay area is amazing. Our waters offer knee to waist deep areas and steady winds. Based on your residing location and the wind direction we will determine best area for that days lesson. Our primary location is the Skyway Bridge but we also have instructors in sarasota and Tarpon Springs. Kiteboarding is a way of life. The physical and mental exercise needed for a happy life style. This article explain why you should start. What every student should know. Take the next step and read into what you should know about kiteboarding before you begin. At first 70% kite and 30% board. 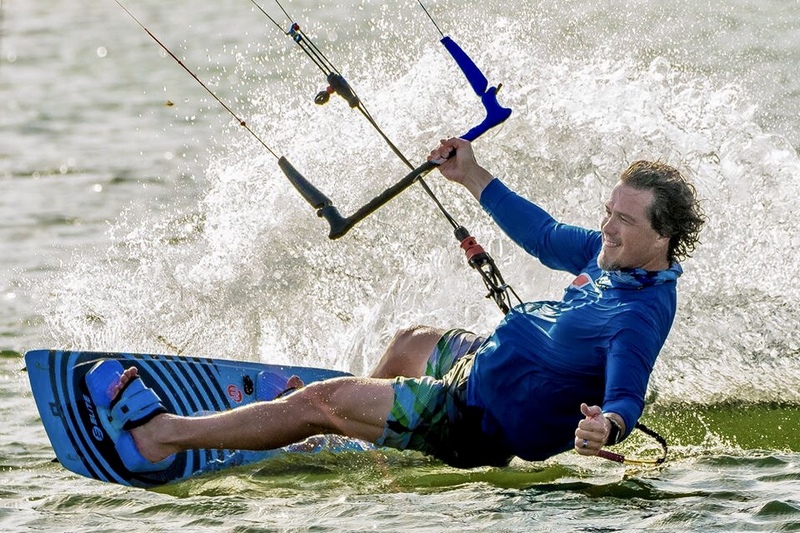 There is so much to learn with kiteboarding. Here is a quick read on the basics before your lesson. Trainer kites can be a huge part of your success. Investing in one of these will help smooth the learning curve. Click here to see how to get to your lessons. Based on the wind conditions we will advise you where to meet us the day before your lesson. All of our instructors follow a structured lessons plan that is adapted to each students needs. All students have a rider profile created to maximize progression. 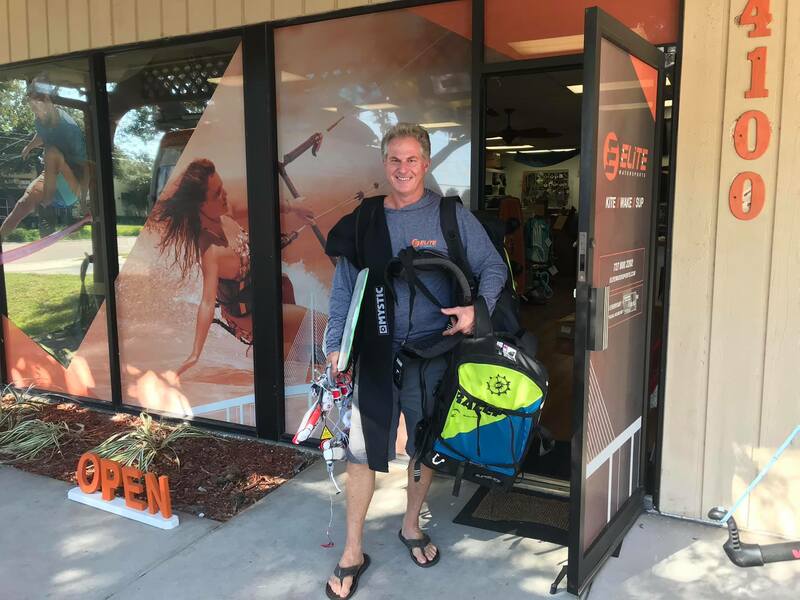 If you truly want to learn how to kitesurf you’ll pick the very best in the Tampa Bay area, Elite Watersports. Our Lead instructor; Born in San Andres, Colombia and served the USA as a Marine. Kevin enjoys his time on the water with clients and teaching previous students new tricks. 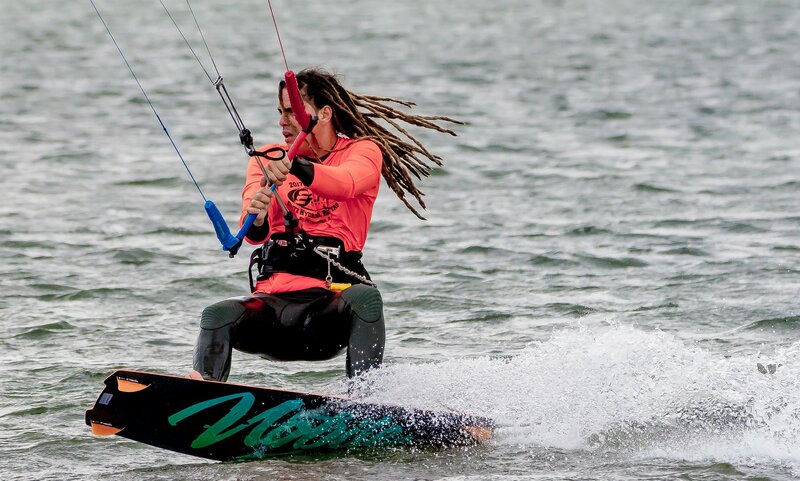 He started kiteboarding in 2012 and has made it a life changing passion ever since. His patience and sense of engineering help to provide theory and explanation. Known for his vast array of extreme sports and water background, he always has something fun to talk about. Colorado's snow cover mountains were his calling until he moved to Florida. Now he seeks elevation with a kite. With an awesome outlook on life, he's always smiling. When he's not behind a kite you'll find him behind a camera lens taking some of the best shots out there. Living and breathing kiteboarding and all that it offers. Either on the race course or in a big air comp, he's driven by the excitement of learning something new. Meet him at the shop or on the beach, he's a huge part of what we do. Brad was a career paramedic/firefighter and now retired he pursues his real passion, Kiteboarding. With a decade of experience, his style is relaxed and fun, but with the highest emphasis on safety. His main location for teaching is Tarpon Springs.